Song that is highlighted. Clicking with the mouse will jump directly to that preview. Enter passcode with correct capitalization. There are different passcodes for each song. Also capitalization is important. 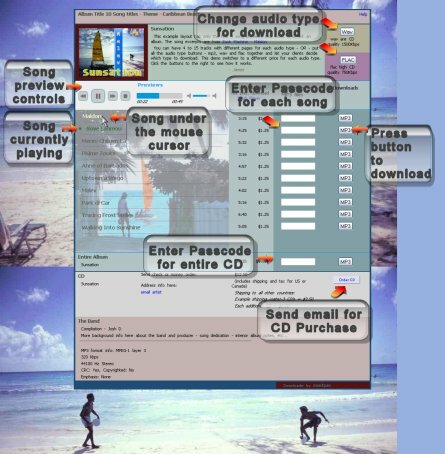 One passcode can download the entire CD collection. If the passcode is correct, the button will start the download. access your computer. Click here for options..."
Internet Options / Advance/ Security section / Check box "Allow active content to run in file on My Computer"